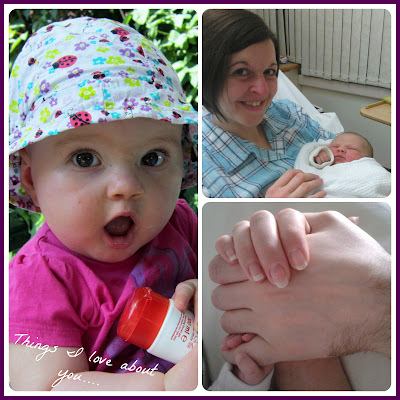 Learning the ropes of being a mummy to a beautiful baby girl who was born on my 30th birthday. Couldn't have asked for a better present. Another week gone, the weeks really are flying through and before we know it it'll be the big C word! - Crazy. Just another quick post this week as the little ones napping and I've got to get some things done whilst she's sleeping or they'll never get done. We're having a period at the moment where she's back to waking up through the night again. I"m not sure if it's due to her crawling, climbing and learning so much more every day that she's regressing again throughout the nights or what but it's hard getting up again throughout the night for an hour or more until I can get her back to sleep. Ulg... lots of caffeine is needed! I'm going to give it a go making my own pizza dough in order to try and make a bit of a healthier pizza. It may be a complete disaster but sure, got to give these things a whirl. I was struggling with Saturday/Sunday as what to have and then was reminded by hubby that I'm down at my mum and dad's on Saturday at a BBQ they're holding (lets hope for some good weather) and he was meant to be joining me but it's his friends stag do that night so he'll be out with his friends instead. 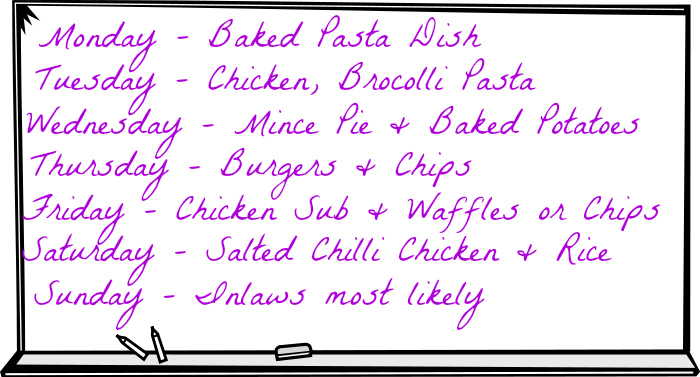 Which also means that on Sunday we'll be having separate lunches as well. My family live approx 30 miles away so there's not really much point in him travelling down just for lunch and then having two cars driving home again, so we'll both be at our respective parents houses. On Sunday morning I'm meeting up with some of my friends and their little ones! A girl who I've known since P2 lives in Scotland now, she's home for a holiday seeing her parents so I'm heading over whilst at home myself to see her and meet her little one. Her cousin, who also has a little baby is coming over too and her sister as well. It'll be nice to see everyone again and hopefully get a group picture of us all now with our babies. Hope everyone has a nice week. I'm sure some of the schools are back again this week which no doubt parents are glad of! I'm linking up with Mrs M so why not click on the badge above and check out what everyone else is having this week. No tricks, no scam, no review, nothing along those lines, just a code I was emailed from TheWorks.co.uk after purchasing some children's books for the little one and I thought I'd share it. 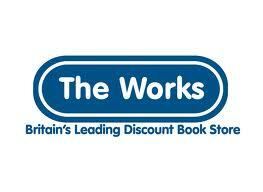 It's simple, if you want to use the code all you have to do is click the following link http://theworks.refr.cc/TNKB7Z4 and you'll get 15% off orders £10 or more. The discount expires on 18th October 2013 so why not check it out and get some Christmas shopping started early! Another Monday rolls round and we're edging closer towards September! September, where has the year gone so far? This time last year I was 7 months pregnant and waiting for the arrival of the little one in November and now we're nearly at her first birthday! - Arggg. Just a quick post before she wakes up. Just noticed I've spelt broccoli wrong in the picture but it's Monday morning and I don't have the heart to do it again! The baked pasta dish is a freezer batch from the last time I made it..It makes about 5 batches of the sauce and then you just make the pasta each time which is handy! I must get another batch made soon. Chicken, Broccoli Pasta (I can't remember what it's actually called), is a recipe my mum found years ago on the side of the Campbell's condensed soup tin. Basically it's chicken, carrots, broccoli, pasta, condensed chicken soup, milk, stir, simmer and Bob's your Uncle a yummy tasty dish that can be served with crusty bread. Salted chilli chicken is rather tasty and simple to make too. I must point out that it looks that we're being rather unhealthy with chips two nights in a row. We make ours in the actifry, which is meant to be the healthier way to make chips and so therefore it's possible we may have them two nights in a row. Hubby and I are both trying to be good, cutting down in portion sizes, no cakes, buns and plenty of fruit etc, but were somewhat disappointed when we weighed ourselves at my mums yesterday only to find that there was hardly any progress and we've been doing it for a good 4-6 weeks now. Bahhhhh. Hopefully we'll not lose motivation though. Morning all, Monday again and into August. I can't believe that we're closer to this Christmas than we are last Christmas (yes I did just say the C word twice! ), over half the year gone and I've really no idea where it has gone to as it's gone by in a flash. I must be getting older when I'm talking about time passing by so quickly. Last week is a bit of a blur, we didn't get out much as the little one was wanting to nap and was a little grouchy I think due to teething. Hopefully we'll get out a little this week just to get a change from the same four walls. 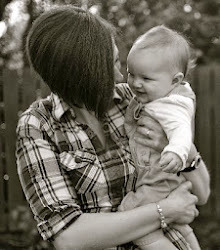 One of my friends is coming up tomorrow with her wee baby girl so will be lovely to see them and have some lunch. Hoping to get round this week to see another friends new wee baby boy. Oh! Also, we go our photos from the photo shoot on Saturday - eeeeeeeeeeeeeeeeeeeeeee! So excited, I love them but just can't decide now which one to put up on the wall. 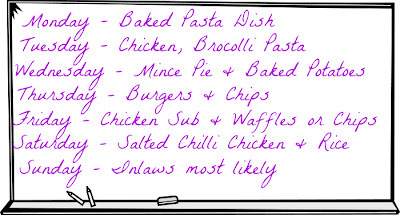 Anyway, on to this weeks meal plan. Last weeks went pretty much to plan but Saturday went out the window as I forgot to leave the chicken out of the freezer and so we ended up with a chinese instead - whoops! This weeks meal plan isn't that exciting either but sure! 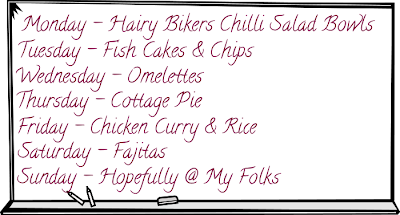 So what are you all having this week? Have a good one, whatever you're up to. I'm linking up with Mrs M so why not click on the badge and find out what everyone is having this week. Hope everyone had a good week. It's terrible, I'm sitting here trying to remember what we actually did last week and I can barely remember! Memory isn't what it used to be.... The sun dipped in and out and heavy showers came on quickly so we stayed around the house and tried to get some things done. Hubby and I got to go on Friday night to view the pictures from our photo shoot last Saturday. I was anxious if they would be any good as it was an exceptionally warm day and the little one hadn't really napped so it was just a bad combination. I needn't have worried as they were beautiful and of course it made it extremely difficult to decide which ones to pick. We eventually decided on 9 photos that we're getting on disk so we can get prints, wall art etc ourselves.... I hope it arrives this week as I'm chomping at the bit to see them again. 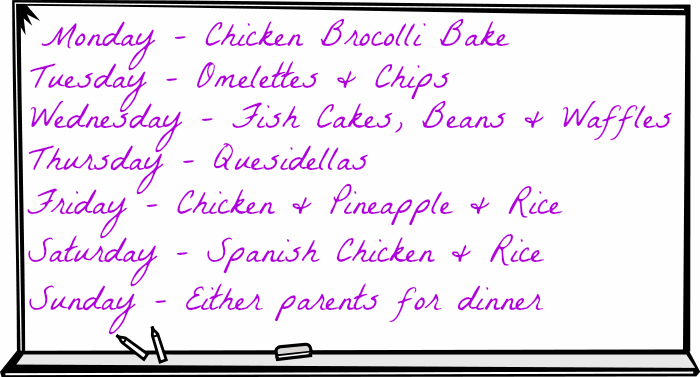 We stuck to the meal plan last week, although the little one refused a few dinners. Don't know if she is getting too independent and wants to feed herself all the time and so is refusing when we spoon feed her, but if I leave her to her own devices she doesn't get an awful lot in her belly. 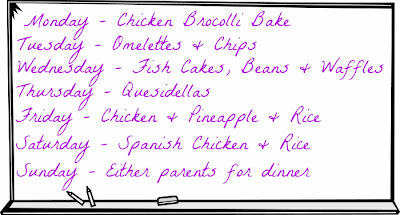 This weeks meals are pretty uninspired, finding it hard to find things that we can all have together without it being repetitive every week. There's a few meals on the plan that she won't be having and instead will be having Chicken, Vegetables and potatoes, Chicken & Summer vegetables and Tuna Casserole....hopefully they'll all go down ok :s Any ideas of what to give her would be gratefully received. The baked pasta dish is a batch I already have in the freezer and am trying to use up before it's been in there a little too long. By Thursday I was completely uninspired so am just going to stick my head in the freezer and see what there is, there's bound to be something in there that needs used up anyway. The smoky philly chicken is scrumptious and we haven't had it in a longggg time, so will be good to have a change with it. 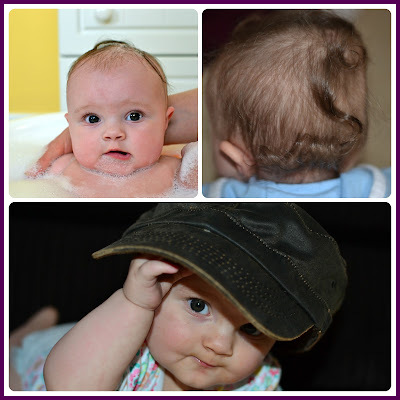 I'm linking up with Mrs M, so why not stop by and have a nosey at what everyone else is having this week. Tomorrow my beautiful girl you turn 8 months. 8 months that have gone past in the blink of an eye, in some ways it feels like you've not been here that long and in others it feels like you've always been there and I can't imagine life without you. I love how you are so cute when you rub your eyes when you're tired. I love the way you pop your head around the kitchen door each morning to say "Any chance of breakfast Mummy?" Most of all I just love you, for who you are, the person you will grow up to be and I treasure these days of innocence and beauty. The days that you want me to be here, you want me to play with you and you want to spend time with you. I can't stop the time from going so quickly but I can only appreciate every moment that we have together. Before I know it, it'll be your first birthday and our first proper joint birthday together. I don't even want to think about how quickly you'll be going to nursery school, then primary and secondary school, dating, getting married and having children of your own. For now, I just want to treasure that you are my beautiful and gorgeous 8 month old baby girl and hug you tight with all my might. Don't fall off your seat reading this, I am alive and well!! 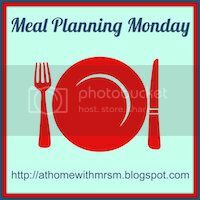 Yes, it has been a little while since posting anything but I have still been Meal Planning behind the scenes. Things just got really busy with the little one and with the glorious weather it made it difficult to get the little one to eat, sleep, want to do anything so I just didn't have the time to get blogging. I also had a wave of what's the point? Does anyone even read this and is interested whether I'm actually here or not? and so before you know it it's over a month without a single post being written and very few being read. I still find time very limited to get reading/writing posts, as it is the little one is asleep now but I should really be doing something productive before she wakes up again. By the time she's settled in bed for night, things are cleared and tidied up, a brew in hand and some chilling time, it's time for bed! I'm in awe of all you who seem to be so much busier than me and still have time to blog. Anyway, so we're back (for this week at least) and hopefully I'll get back into the swing of blogging and find time to be able to just share my thoughts if nothing else. So in my absence on here, we've had some progressions....weaning is still going well and now I'm trying to find meals that we can both have together instead of having to make separate dinners. 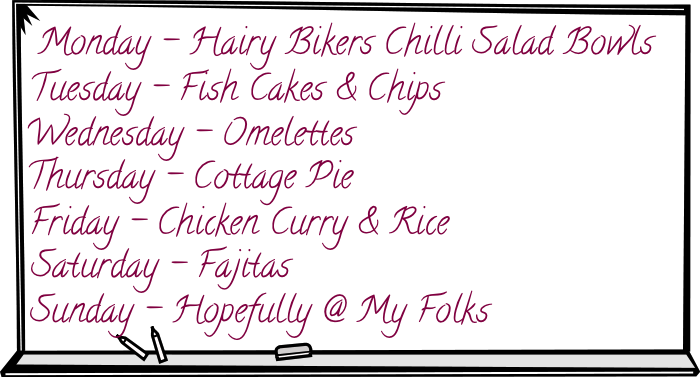 Any thoughts on meals that could be made or ideas of lunches would be greatly appreciated as I'm running out of ideas. Also, about 3 weeks ago JD started crawling forward! She had reverse gear, side to side and complete about turn but could never seem to get forward. Now there's no stopping her, it is more like an army crawl but she can fairly shift and now I need eyes everywhere! 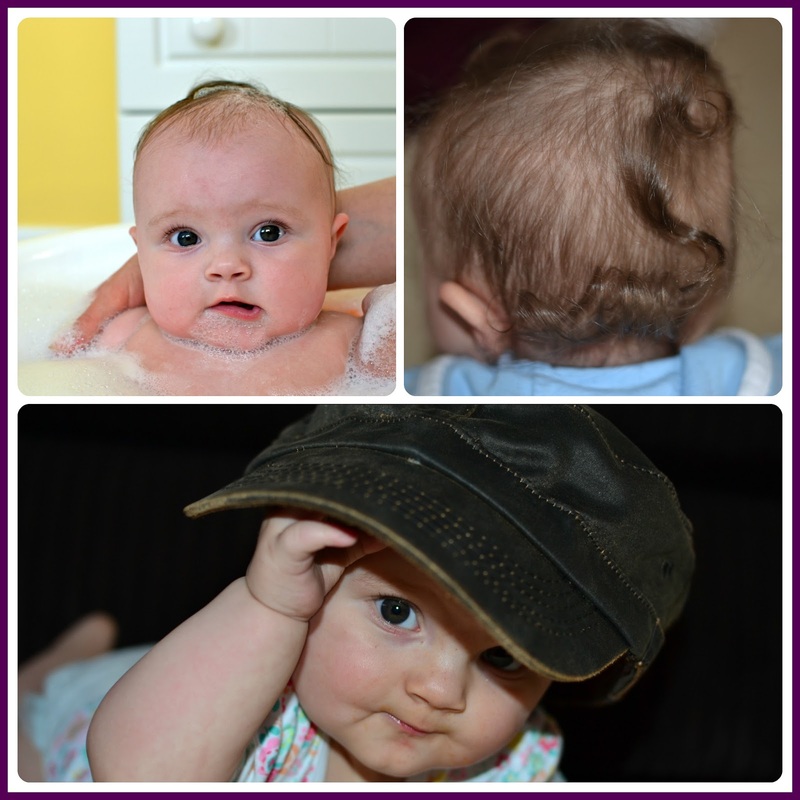 I'm linking up with Mrs M, so why not click the link and take a look at what everyone else is having this week.